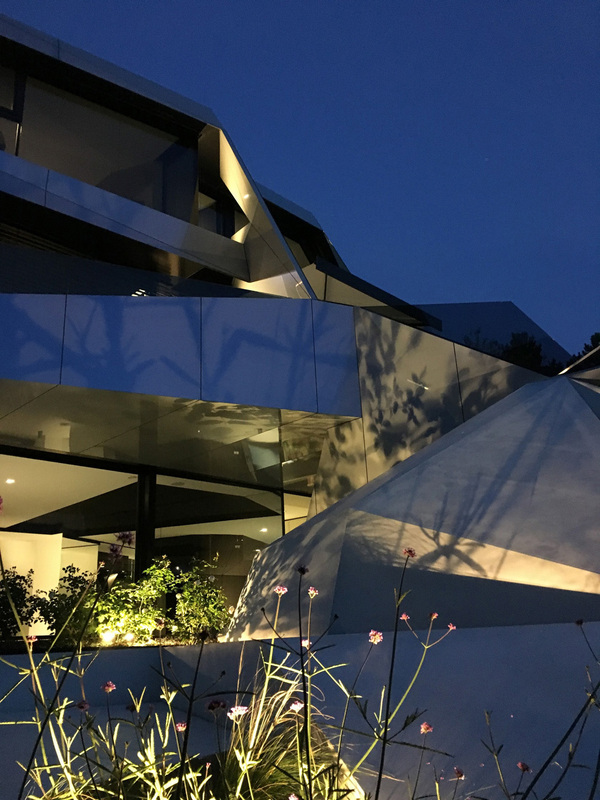 Following the slope, the light-flooded residential “CoMED” building develops in a crystalline, conspicuous shape. 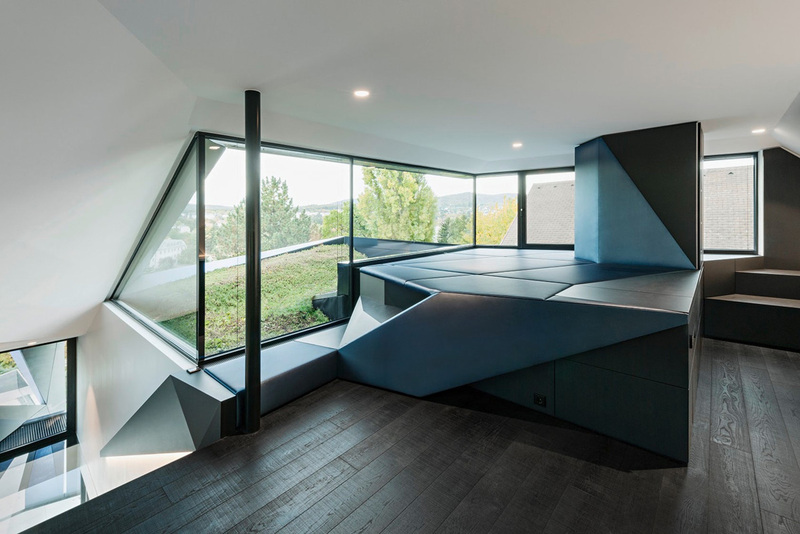 Similar to a ski jumping facility, the Residential as a compact living space sits on the slope of its habitable outdoor areas and projecting swimming pool, similar to a jump-off platform to the downhill garden area. 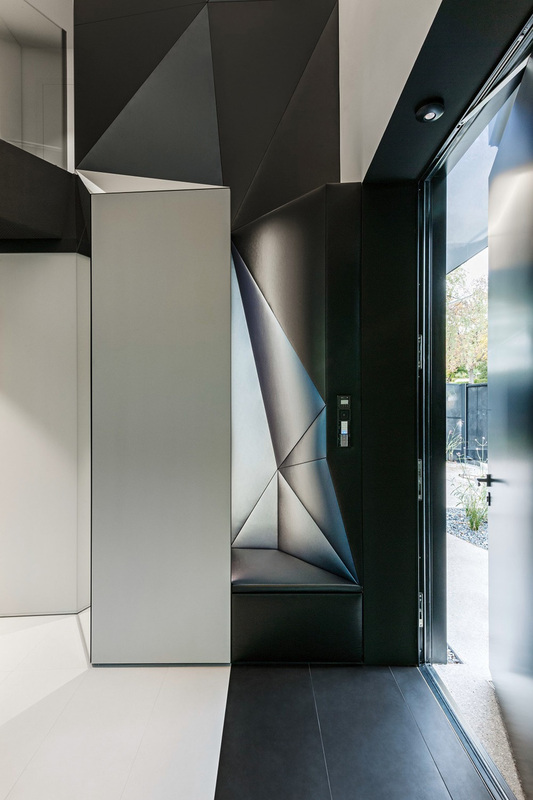 The roofed entrance to the house, the “business card” of the residential building, is a playful part of the building, which rises from the valuable 3-storey building entrance to the front garden and draws attention to the access. A court-like incision planted on the street facade creates exposure and connects the front garden with the upper-level living area. The treetop creates uniqueness for the parents bathroom. Basement and pool are made of concrete and the overground areas are made with steel skeleton and KLH wooden building elements with a dress of aluminum composite panels, reflecting on the weather. The building envelope develops along the street as well as on the garden side up to the adjoining horticultural terrain level. 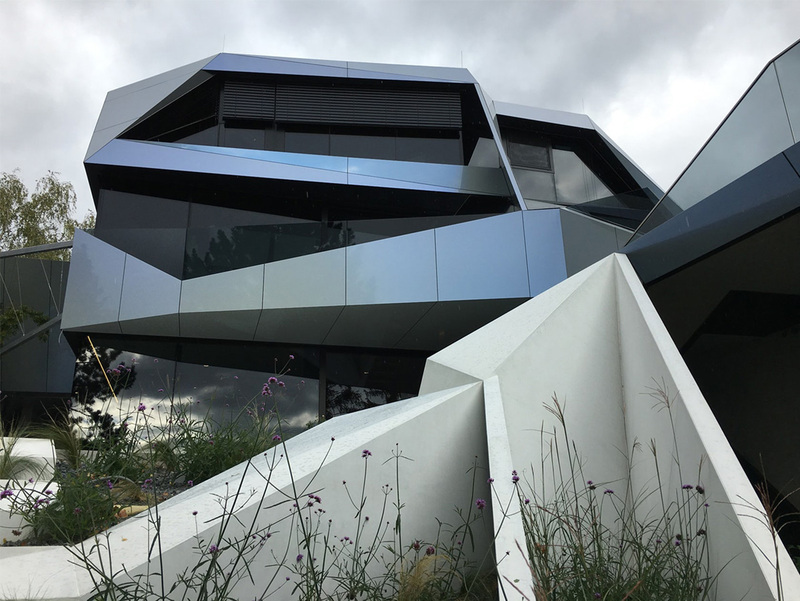 The basics of the colour concept are the so called non-colours black and white, mixed with blue and silvergrey – according to the facade material “galaxy blue” – which relates to the water, to the blue sky and so on. 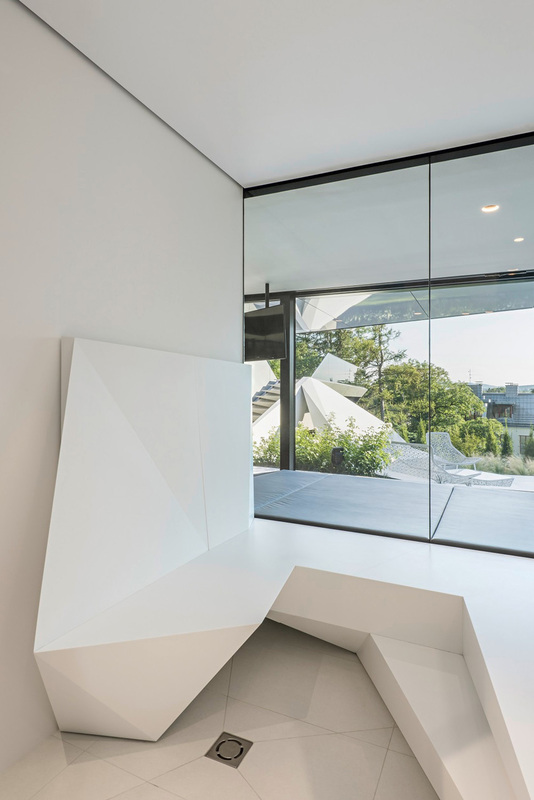 Corian for moisture-prone areas, blank steel for the stairways and the furniture beside the fireplace, fabric surfaces for cosyness and pleasant room acoustic, painted board materials for normal use. The design of all these custom made interior transform the clear association to the architecture of the 4 storied house. The fitted furniture creates a unit with the building. Every thing has their own place. It provides a tidy surrounding for the user – less influences means better physically recovering. 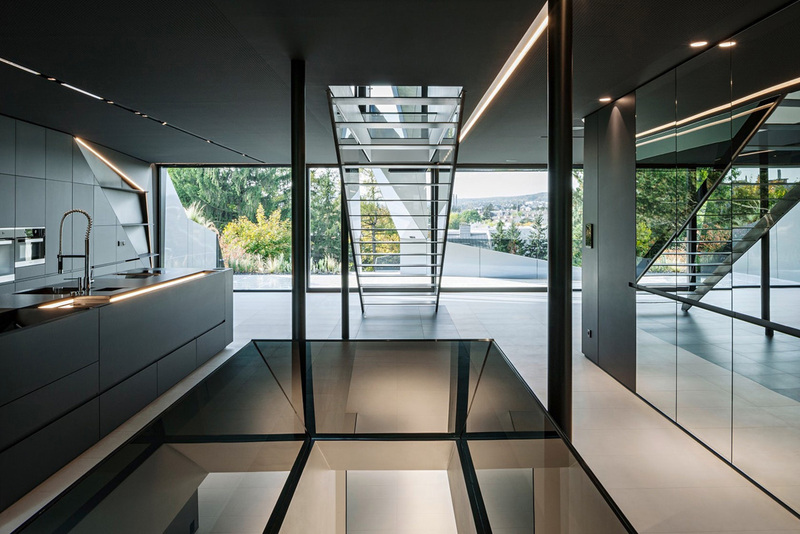 The interior is body shaped for the client-specific, packaged in one stream. We used the “in beetween” of the main functions to do it like on an unique and visionary style on its focus on well designed and well functioned. 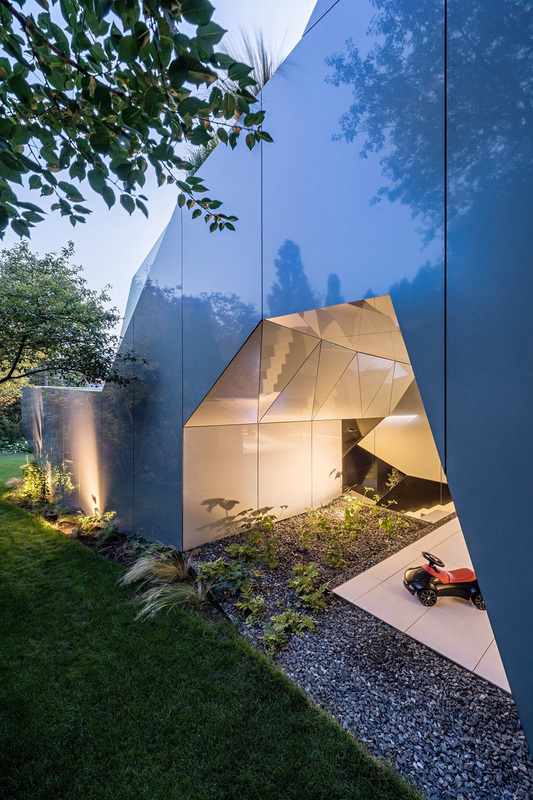 For merging garden with the folded facade on the hillside of the plot, the “garden folding” in white was created. Made of glassfibre concrete panels, this functional object fit the outdoor living area for habitation with their different features. The top connects and envelopes the stairway from the pool down into the garden, the valueable private city green. 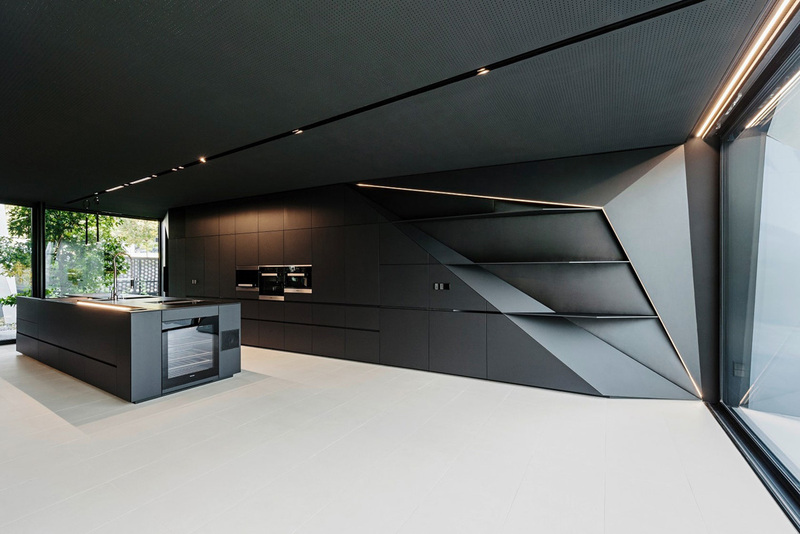 The lounge area – based on the typical form of a fireplace – is situated on level 1 below the street. In the middle there is enough space for the fire itself. A stairway connects the lounge and the lawn area attended with bed-framing for flowers. The gardenkitchen is situated protected, beneath the skulptur on level -2. A huge aslope crack planted with giant miscanthus emphasize the transition of garden and building.